Standard Conrail containers can maintain any temperature from -30c (-22f) to +30c (86f). 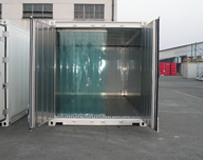 For requirements either side of this range, we can supply you with containers specially designed to achieve and maintain very cold or very warm temperatures: as low as -60C (-76F) or up to +80C (176F). Our extreme temperature containers can be used for a variety of purposes in addition to storage. For example, your manufacturing process may require the temperature of a product to be maintained at a high or low temperature for a specified period of time before progressing to the next process. The interior walls of our extreme temperature containers are lined with 120mm insulation, retaining temperatures at both ends of the scale, increasing thermal efficiency and reducing the energy required to maintain the temperature. Extreme cold temperature containers feature heated door seals to prevent freezing and ensure easy access at all times. Temperature control in both high and low-temperature units during access/egress or loading and unloading is maintained by the fitting of sluice doors which provide a buffer zone to minimise loss of hot or cold air. Depending on your requirements, you can also select from a wide range of options including non-slip floors, internal lighting, power sockets, air filtering and noise reduction. 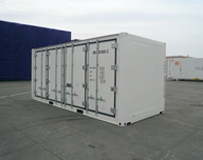 Extreme temperature storage is not limited to standard container sizes. Our mega units offer the ability to create a single zone climate, almost limitless in size and with the ability to be easily increased or reduced in size according to your operational requirements.